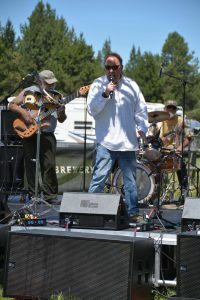 “This Weekend was the fifth annual “Newberry Event,” a 3–Day Music and Arts Festival to Defeat MS. The event was held just north of LaPine and down near the Deschutes River at the beautiful DiamondStone Guest Lodges. The organizers of the event and owners of DiamondStone, are Doug and Gloria Watt. Gloria lives with and deals with MS and they started the event 5 years ago because it’s a cause close to their home and their hearts. 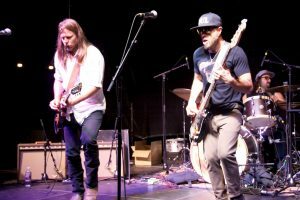 The event had twenty bands ranging from local bands, to the full-fledged National act; Lukas Nelson, and Promise of the Real. I’m more of a rock guy and when I was deciding whether to go down and see the show I almost decided not to go because I assumed (wrongly) that is was going to be a country music show. With the connection to Willie Nelson, (Lukas is Willie’s son) it seemed like a reasonable assumption. When I got to the show I was not surprised when it started with three acoustic songs. With Nelson singing and playing the guitar I thought my suspicions were being confirmed. The three acoustic songs were two Lukas Nelson originals and one of his dad Willie’s songs. All were interesting and very well done. The cool thing about this was how hauntingly similar Lukas’s voice is to his dad’s. From his own unique style, and growing up listening to his pop, has immerged an interesting combination of his own powerful voice, and the pipes he got from his old man. Now On to the part that was nothing short of thrilling. Eventually Nelson invited “Promise of the Real” to the stage. From there, any thoughts I had about this being a pure country show went quickly out the window. At the side of the stage was Jesse Siebenberg playing a beautiful steel guitar which might have made one think this was going to go in that country direction. However, he and the rest of the band can only be described as a world class, first-rate, powerful rock-n-roll band. Hints of Texas Blues, Southern Rock, with threads of R & B and Soul, were weaved into a tapestry of Pure Lukas Nelson. I have this thing I say sometimes that a rock-n-roll band is like a bunch of guys in a car. The drummer is the gas pedal, the bass player is the driver, the keyboard player is the navigator, and the guitar player sits in the back seat flicking the others in the ear and trying to distract them from their assigned tasks. In the case of Promise of The Real, there was simply no distracting them. The grapevine told me that these guys have played 250 to 300 shows a year for the last couple years. There is no better way to polish a stone then tumbling it consistently over time, and these guys are certainly polished. Along with Siebenberg on his steel guitar, was Anthony LoGerfo on the drums providing a flawless gas pedal of tempo and determination. On the keyboards, Alberto Bof provided a swelling and powerful foundation of rhythmic tones to fatten and complete the sound. But for me, the most interesting and stunning contributor was Corey McCormick on the bass Guitar. From where I stood, McCormick was driving a powerful race car and controlling it like Mario Andretti. This band is second to none. Props to Nelson for a perfect choice in Promise of The Real to back him on this tour and his forthcoming album. As for Nelson, he was clearly in charge, leading the band, playing blistering guitar, singing with a manic and determined style, and doing his fair share of “ear flicking.” Something I have grown to love is a band leader that leads in the style of James Brown. Everything is planned and tight, until he decides to take the wheel. No matter how wildly he pulled at that wheel he could not spin the “Promise” out of control. The they just kept it in the lane and smoothly racing down the road. This was one of the best shows I have seen in a very long time!